Once Fall hits, everyone goes crazy for Pumpkin flavored coffee, desserts, candles and more! But honestly, I’m much more of an Apple Cinnamon-Sweet Potato Pie kind of gal! There’s nothing that screams Fall to me more than Apple Cinnamon scented candles and an Apple Pie in the oven. The two just remind me of cold NYC Falls and instantly feels like home. It’s no wonder why Autumn is my favorite season! Now there’s no shortage of Apple Desserts, but nonetheless, this doesn’t mean that you can’t have fun and experiment. 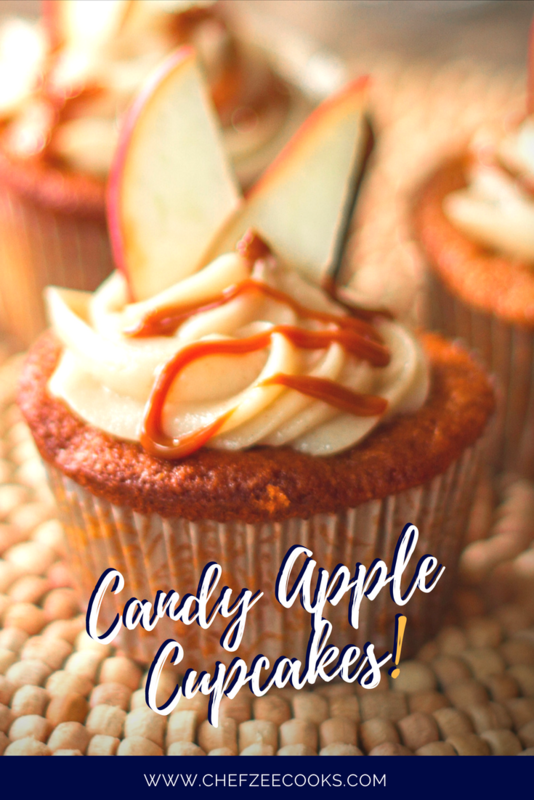 In fact, I had so much Homemade Dulce de Leche on hand that I created Dulce de Leche Apple Pie Cupcakes, which became an instant hit! What started off as me having fun in the kitchen, turned into must-have office muffins. Now it’s totally up to you whether you want to frost these sweet delights. They taste so good on their own that you can serve them up as Apple muffins, which pair so nicely with a hot cup of coffee. They’re also great as an afternoon snack! The beauty about these cupcakes is that they come together effortlessly! The moisture from the apples saves you from having to add extra moisture in the form of cream or milk. Don’t worry if you’re a newbie baker. This recipe is newbie baker approved! Trust me, it took me a while to build up the confidence to make tiered cakes. In the process, I created a ton of easy-bake recipes that will have your guests turning heads! In fact, I created this recipe PURELY by accident! I was knee deep in making 50+ cupcakes for my boyfriend’s family party when I messed up BIG TIME! I was originally making Dulce de Leche cupcakes when I placed my perfectly mixed and filled cupcakes in his mother’s oven. Unbeknownst to me, her oven was a convection style oven, which was vastly different from my regular oven at the time. Who knew that those two ovens were night and day different! Nonetheless, I popped the cupcakes in the oven without adjusting the temperature when mayhem ensued! My cupcakes rose and fell creating perfect craters in the center. Since I didn’t catch it right away, the cupcakes ended up baking to a cookie-like crisp texture. Oh my goodness! I freaked out. My desserts were set to be the center of attention and here they were completely ruined! I quickly thought on my feet and created an Apple Pie Filling. One thing you should know, is that Hispanics Desserts usually have cinnamon! So I knew that anything with cinnamon would be a hit. Alas, I swirled the Dulce de Leche overtop and popped a humble dollop of Cream Cheese Frosting. Like shamed dog with its tail between its leg, I carried on and took my cupcakes to the party. I had failed. **sigh** or at least I thought! The cratered Apple Pie Cupcakes were a HUGE hit! I’ve since remastered the recipe to have apples in the actual batter, which are just as popular as my original Oops cupcakes. The cupcakes are moist, cozy, and will instantly make you appreciate the Fall Foliage! 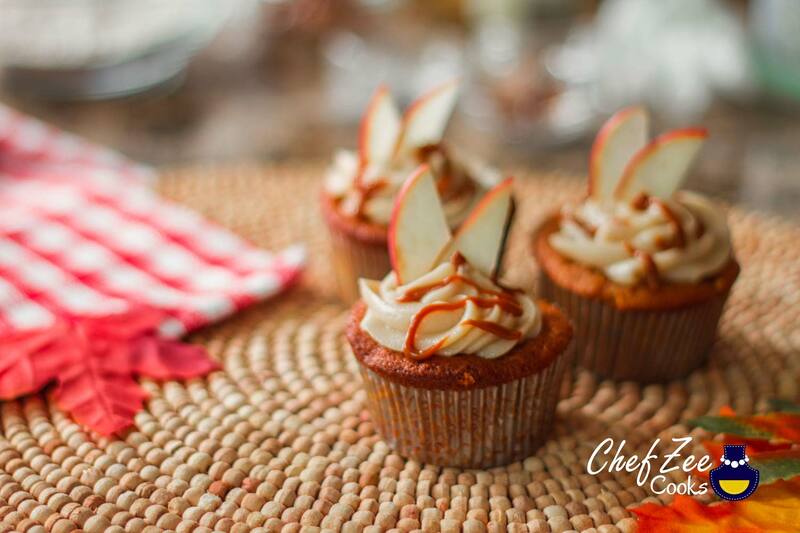 Give this recipe a try and don’t forget to watch my YouTube Video on How to Make Dulce de Leche Apple Pie Cupcakes on my YouTube Channel: Chef Zee Cooks! Don’t forget to Pin this yumminess to you Pinterest Boards! … And now for the recipe….